Looking to ride around town in lavish style? Great news, Kingwood Luxury Limo is here to service Kingwood, Humble, Atascocita, Huffman, Crosby or any surrounding area to do just that and beyond. Our rental service provides party bus, airport sedan and limousine transportation. Call our Kingwood limo rental service at 281-713-9434 or submit the form on this page today! There is absolutely no better way to ride in style with our rental fleet whether it's for a ride to the airport, birthday, casino, wedding or maybe just an unforgettable night out with friends. Our exceptional chauffeur service is there to accommodate whichever event you desire. Whether it's renting our party bus or limos we are here to service you. Our limo rental fleet is luxurious yet most importantly affordable. Our limo rentals and party buses are guaranteed to obliterate any price you've already been offered. Most limo & party bus services in the area will bargain back and forth but Kingwood Luxury Limo is here to save you the hassle and book your lavish ride today. We have professionals on stand by waiting to hear from you and answer any questions you may have. Our goal is to meet within your budget! 1) Our Fleet Redefines Luxury: The elite quality of transportation our limos offer is second to NONE. We take pride in offering travel services via limousine, sedans, SUVs and of course party buses. Our limo and party bus rentals provide you with a smooth elegant ride, whether it's for you and that special someone or group of friends who are wanting to dance the night away. We have also installed updated GPS systems to help navigate any area necessary. All of our vehicles are equipped with elite branded sound systems via Bluetooth or USB connections. 2) Our Staff is a top reason for repeat customers: Our chauffeurs and employees have completed extensive training and customer service exercises to guarantee 100% satisfaction to all of our customers. The first concern we have for you is your safety which means all of our employees have been screened for background checks & reoccurring drug testing. Our chauffeurs are committed to help guide you through your special occasion without any distractions. Our staff is exceptionally trained to execute a corporate & professional setting at all costs. 3) Wondering about our pricing? Our limo company will dominate any of our competitor's pricing. We are here to not only provide you with luxury rentals & elite services but also looking to save you $$$. If you receive a quote from one of our competitors we guarantee you we can annihilate their offer. Party bus rental or limo service we promise we can counter with the best offer! 4) Stressing over party size? We understand the stress in planning a party bus or limo can be difficult when you cannot get an exact head count. No worries because whatever number you submit your quote for it can be shuffled on a dime. No need for scrambling at the last minute we will accommodate your party of 2 or party of 40. 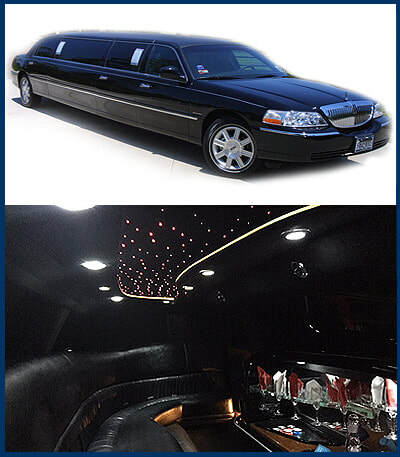 Our limo size can vary but call one of our reps to help you. Same with the party bus service, let us know a number and we can deliver. 5) Corporate Setting: Our Kingwood limo company is proud to be located in the best state our great nation has to offer. Not only that, Houston's economical growth exceeds most cities in the world. With that we understand companies need to entertain & impress clients to expand business. Call today and we can arrange to pick up any one of your clients in style whether its out of town or any surrounding airports. 6) VIP Status: Our limo and party bus company is dedicated in making your group feel like your headed to a premier red carpet event. 7) Punctual is Top Priority for Us! We guarantee to be on time for pick up & drop off or you receive an immediate discount. 8) We cover Harris & Surrounding Counties. Our limo rental company can make arrangements to pick you and your party up in Harris County, Montgomery County, Liberty County, Chambers County, Galveston County, Brazoria County, Fort Bend County and Waller County. 9) We cover Houston & Surrounding Areas. Our limo rental service provides choice transportation to Kingwood, Humble, Houston, The Woodlands, Spring, Tomball, Cypress, Katy, Sugar Land, Stafford, Missouri City, Pearland, Alvin, League City, Galveston, Pasadena, Baytown, Huffman, Dayton, Crosby, New Caney, Splendora. Where you desire we can make it happen! 10) Easy, Breezy! See the form on this page? Fill it out and we will be contacting you shortly to lock down your reservation/rental today. Also, feel free to call us directly at 281-713-9434. Now, let's get this party rolling!!!! Any special event you desire!